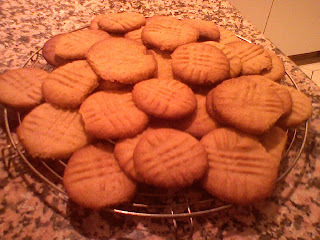 Mmmm piled high peanut butter cookies fresh from the oven...and they were great! I made these babies (yes I am the type of person who refers to her baked creations as babies) for my friend Esti, who is a peanut butter fanatic. I went to visit her for a couple days, and brought these along. The making and baking of these went pretty smoothly, and I created the signature peanut butter cookie look on these with simple fork marks. Although this pattern is traditionally for PB cookies, you can have fun with a fork or knife in creating any sort of pattern on your next cookies. I recommend a skull and crossbones. Anyway the only worrisome part of these creations was transportation. I, not surprisingly, was very concerned about them breaking or crumbling in transit, but I was going from a subway to a train and then a ten minute walk, and I didn't want to carry them separately. So instead I placed the cookies carefully in a plastic bag, and then wrapped the whole thing twice around with bubble wrap. It took up a large part of my suitcase - had to leave a pair of shoes behind! - but every cookie made it there in beautiful shape. Although Esti insisted on making fun of me the entire visit. Sigh. Oh the price I pay for baking perfection. Tip of the Day: When baking with peanut butter, measure out slippery ingredients like oil first, then your peanut butter will easily slide out of your measuring cup.